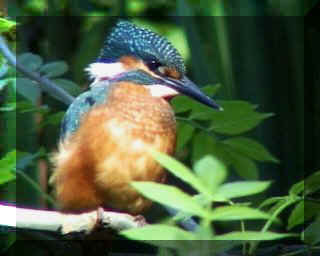 Kingfishers are small very colourful birds of unpolluted waterways. They feed on small fish and invertebrates such as dragonfly larva. They make nests at the end of tunnels which are dug into a bank which is usually in or immediately adjacent to a river or stream. They lay about 6 eggs. 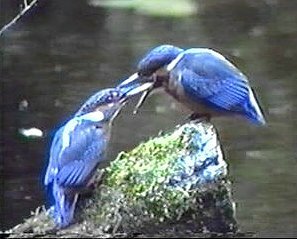 The each nestling is fed as many as 20 small fish a day. However within a few days the highly territorial adults will chase the young away as the adults will start to breed again. In some years they may have as many as three broods of chicks. The male and female adults look very similar but an easy way to identify them apart is to look at the underside of the bill. The female has a long red base. Size: 16-17cm. Call: Shrill whistle like.